If you look at the science about what is happening on earth and aren’t pessimistic, you don’t understand data. 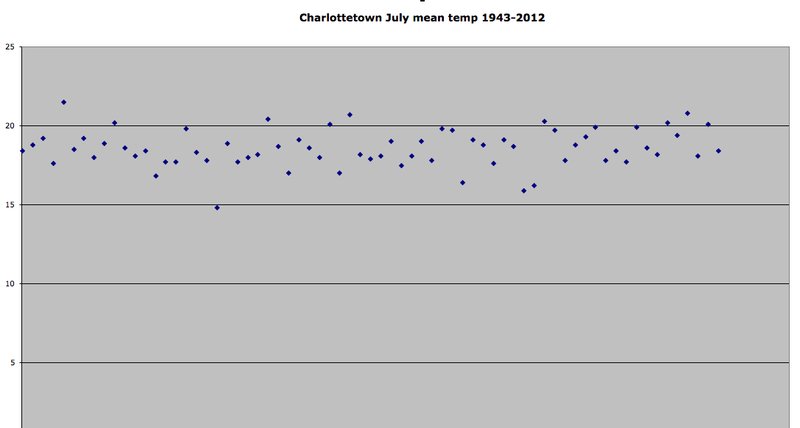 I plotted July mean Temperature and discovered there is ZERO temperature trend. The complete data set is available here. 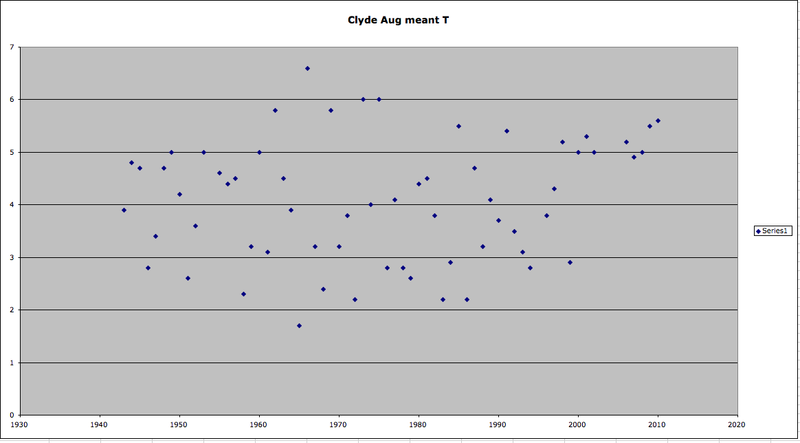 Last July mean 18.4C was exactly the same as the earliest year in the data set, 1943. So it isn’t getting hotter in his hometown. I wrote his group a letter asking what it is about the data I don’t understand. I also included a broader look at temperature across the globe. Above: Here is the latest monthly satellite update for October 2013 from RSS. An interesting milestone was reached this month in that we now have exactly 17 years without any global average temperature increase as measured by satellite. Again, it makes me wonder what it is about these data I supposedly don’t understand? One of the absurdities about the 17 year mark is that there are now students going into first-year university climate programs who have experienced zero warming over their entire lifetimes. For CBC to give airtime to someone who claims I don’t understand the data is pretty insulting and a massive case of projection. 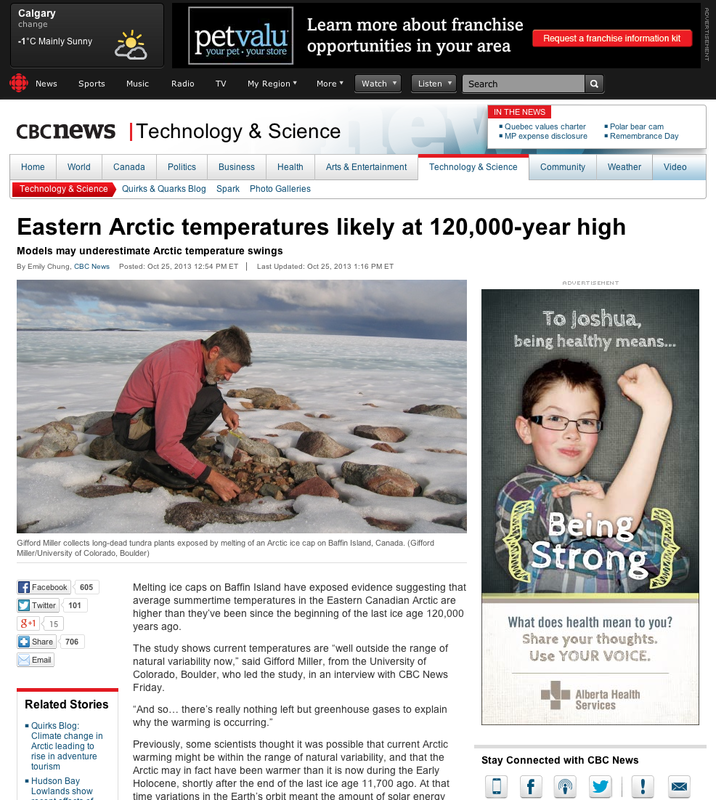 What makes this study more odd is that there are hundreds of studies that show categorically that it has been much warmer in the Arctic in the recent past. 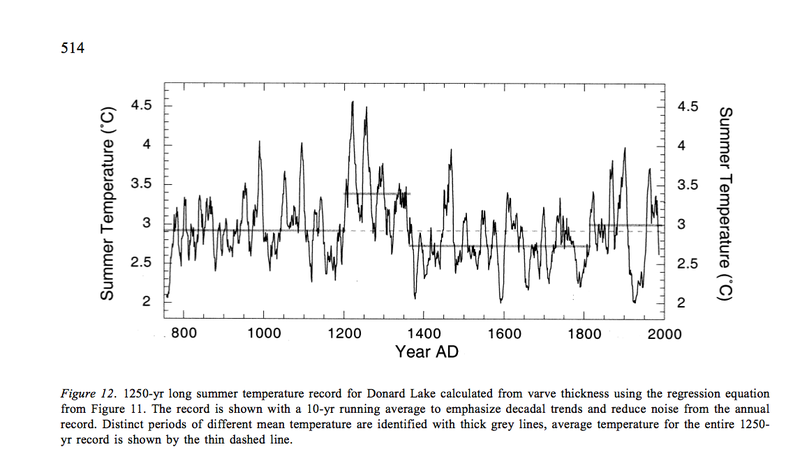 There seemed to be no mention in their study that all the physical evidence for warmer temperatures in the past is all incorrect! There are remains of trees that were growing far north of the current treeline in Canada. Pollen layers in Arctic sediments clearly show biological activity indicative of warmer weather by several degrees. This has been known and studied for generations. Just 2 minutes on the internet and I found a study (Spear 1983) that collected spruce pollen in Arctic locations indicating that 3,500 years ago, the Canadian treeline advanced far north from its current position. 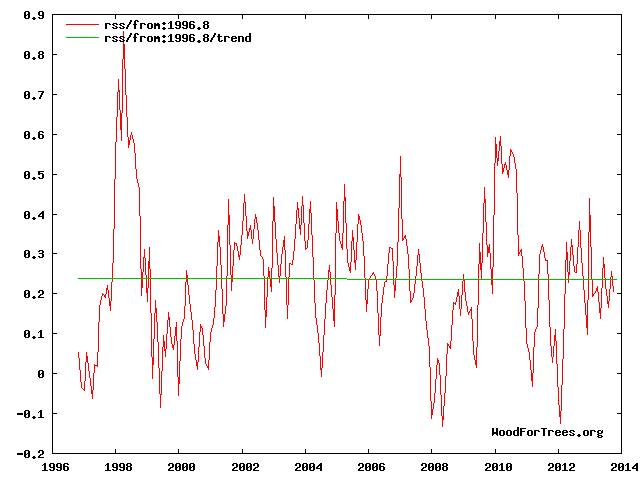 Clear and uncontroversial evidence of temperatures much warmer than now and all due to natural variability. Above: from Moore 2001, a sediment study on Baffin Island showing multiple periods of higher temperatures. 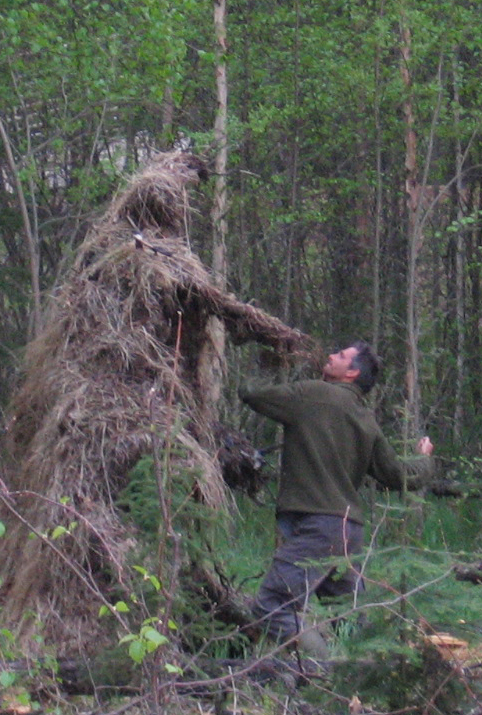 I picked this study but there dozens of similar ones to choose from. Even in my own backyard, the retreating Athabasca glacier is uncovering old trees that were growing at a time much warmer than the current tree line limit. Even more astounding is that the authors of the study go on to suggest that not only is it warmest in over 100,000 years but they attribute that warming to greenhouse gases. Even assuming that their conclusions were not contrary to massive amounts of replicated, physical evidence, their results tell us nothing about the attribution of the claimed warming. That they should make such a logical failure in their conclusion tells you much about the logical failure of interpreting their results. I am truly amazed that this study was written, more amazed that it passed “peer review”, and more amazed that the journal editor didn’t send it back. But I am not amazed that CBC pitched this study screaming from the rafters that the sky is falling. They are anti- science. They promote disinformation. I have nearly given up polite letters showing clear and simple evidence contrary to their claims. I am open to the excuse that CBC employees do not have even the 4 or 5 minutes of free time it took me to check the validity of the claims in this study. But when polite correction and literature referals go unheeded and unrecognized, I am left to conclude their ignorance is willful. Even more depressing is that I pay for this service whether I want it or not. Clyde River, near the study location on Baffin Island has a temperature record going back to 1940. It seems the authors made their outrageous claims without even looking at a thermometer. Environment Canada shows the warmest August temperatures since 1940 on Baffin Island were recorded more than 50 years ago! The study authors aren’t just incompetent, they’re lazy. It took me just 45 seconds to double check the historical thermometer record and disprove their claim.. Thanks again for keeping the candle burning in our tiny window of scientific literacy.